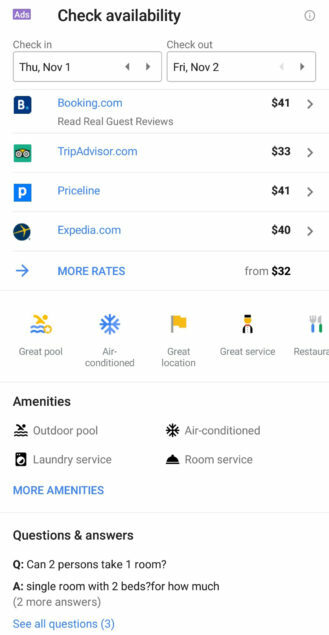 Recently, Google announced many new features coming to its travel planning services, including flight and hotel insights. 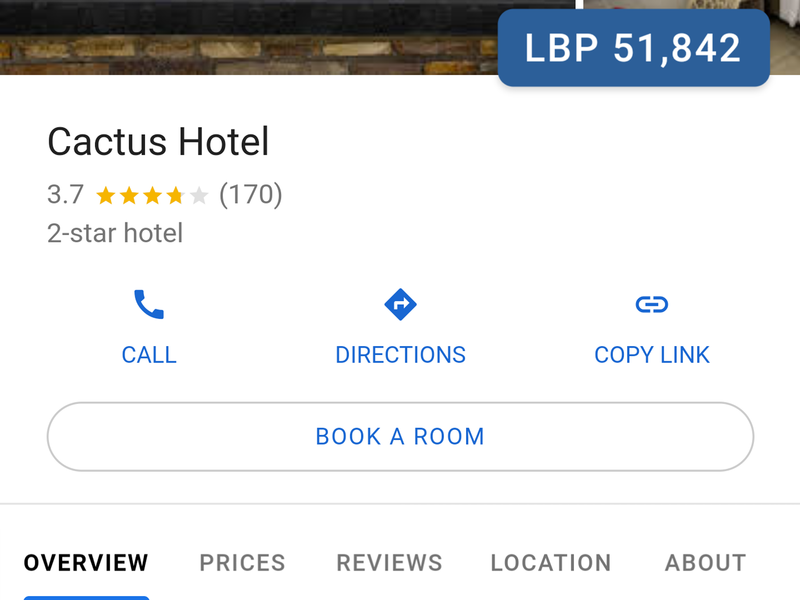 Those changes are only a small part of the overhauled hotel listing layout that's rolling out to Google Maps right now. While the design appears to be cosmetic at first, with plenty of the new Material accents everywhere, you can quickly spot many useful new additions as well as some very worrying feature removals. Listings for hotels on Google Maps don't look like other places anymore. The entire layout is changed, from top to bottom. 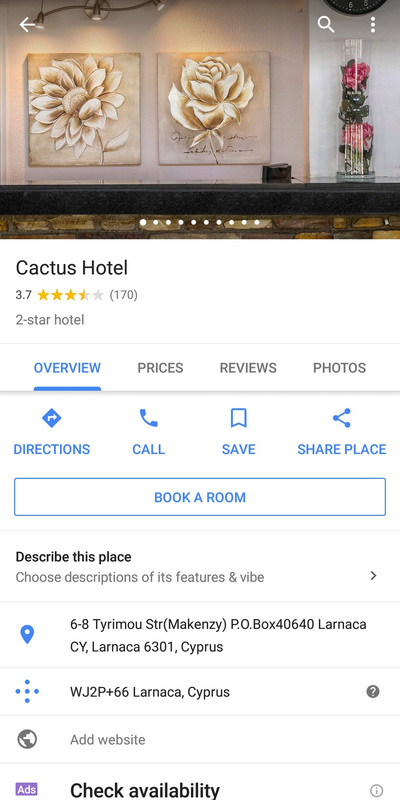 The focus is on what you expect from a hotel — reservations, reviews, how good its is location — and not on what you'd need from regular Maps places. Left: Previous hotel listing layout. Right: New layout. Gone are the image indicators are the top, though the carousel is still there and you can still swipe through photos and tap to view more. Also gone is the search icon and the overflow menu. That means several important features are missing here. I've looked through every nook and cranny, yet I can't see these options anywhere now: add to contacts, suggest edit, add photos, and add to visited places. Sure, you may be able to perform some of these actions elsewhere (like uploading photos through the Contributions tab), but it would make sense that they were accessible from the hotel listing itself. The price per night now shows up in a nice blue box on top of the image carousel, and the main action icons have changed. Not only do they have a new design, but they are also different. Previously: directions, save to a list, share, and download the nearby area. Now: call, directions, website, and copy link. As you can tell, the easy sharing option is gone (you have to copy/paste a link), so is saving to a list (you can still add places from the list itself, but come on! ), and the option to download the area for offline use. Baffling. The main tabs have also seen two new additions. 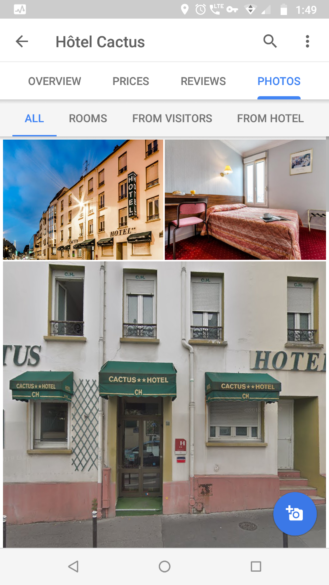 Beside the overview, reviews, prices, and photos, we have now a dedicated tab for the location as well as the hotel's amenities. We'll discuss all the changes to these in detail. The overview tab has seen the most modifications in this new layout. Everything is reorganized to emphasize the hotel listing features above all else. 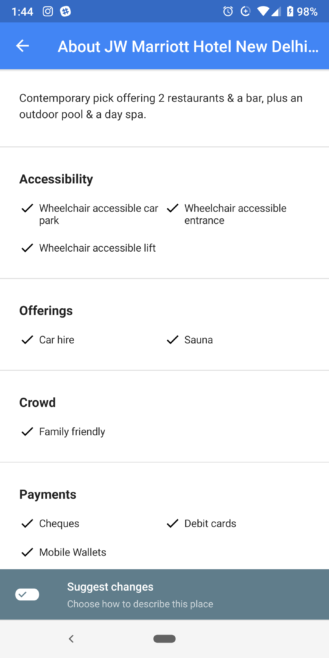 The older layout had the location and website, followed by booking prices, some large icons to indicate amenities, a Q&A section, photos, a review summary and some reviews, an option to suggest an edit, then other places people usually search for. Previous hotel listing overview page layout. The new look orders things differently and adds/removes some sections. Booking prices are moved to the top, followed by a new shortcut to access price insights then similar hotels nearby, and it's only after scrolling that far that you can see the phone number and location. After that, some details about the surroundings and location are provided, then a preview of the amenities, and the photos are dropped to the very end. If you're paying attention, you might notice that the Q&A section has disappeared, along with the edit suggestion option, and the Plus Code for the location. Cody will be devastated. New hotel listing overview page layout. 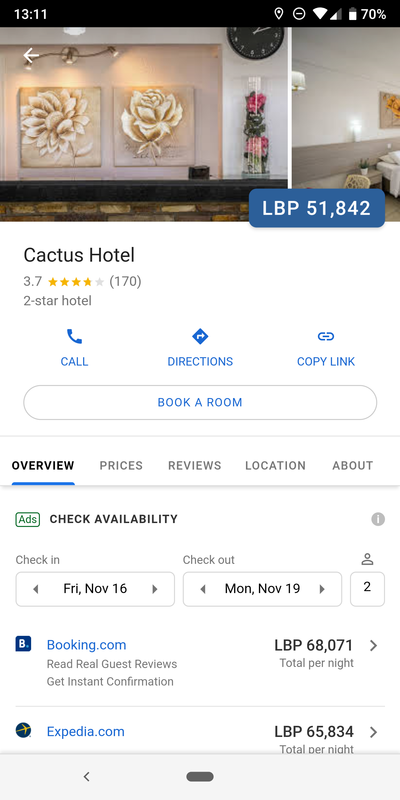 By tapping Compare market prices below the different booking sites and prices per night, you get to a new section for price insights. These include multiple graphs for comparing this hotel's pricing against similar ones, seeing when the ideal time to book it is, and evaluating the price based on historical data. At first glance, the prices tab might not look very different, but there are two important changes there. 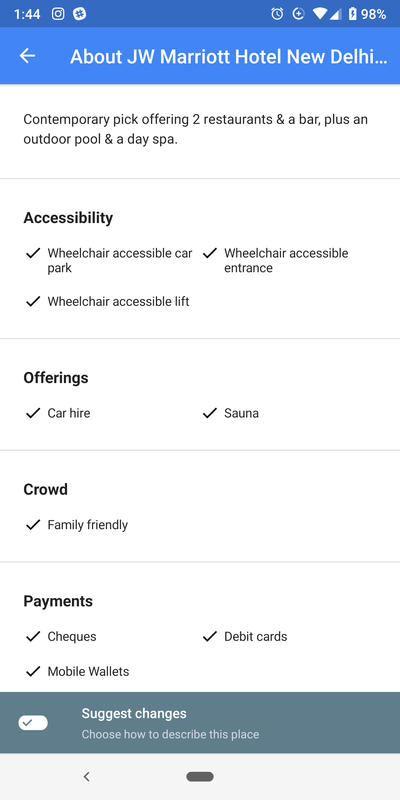 First, you can pick up the number of people you want to book a room for: instead of the default 2-person option previously, you can choose from 1 to 4 persons now. Second, the date selector expands fullscreen to reveal prices for every date. The review tab has seen a large overhaul as well. 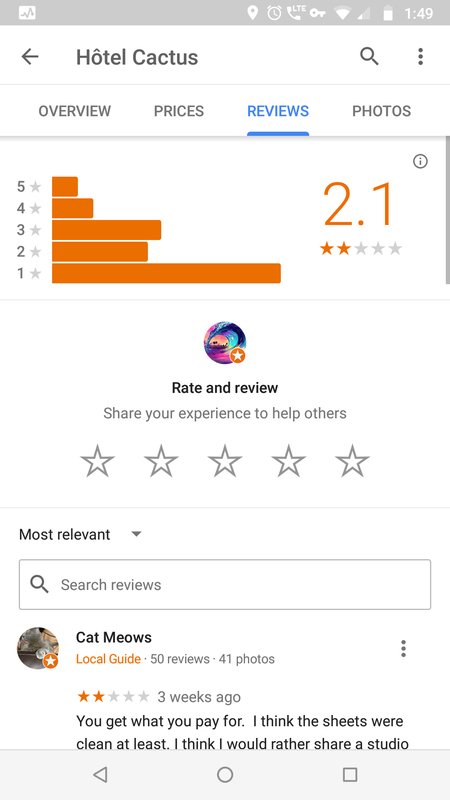 The histogram of 1 to 5 star ratings is hidden now, but expandable; and the option to add your own review no longer takes up lots of vertical space, it's just an icon on the top right. Focus is on the score itself, with sub-scores for rooms, location, and service. New large icons denote scores for couples and solo travelers as well. Left: Previous hotel reviews layout. Right: New layout. But more importantly, reviews now include those submitted on other sites. TripAdvisor, Booking.com, Expedia, and other hotel review site scores are included with links to access them immediately. 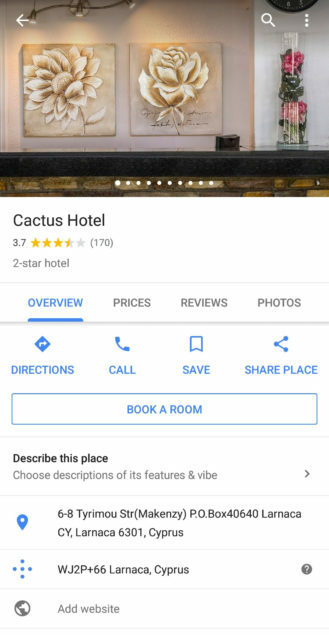 You can even see individual reviews from all these sites and filter by site if you prefer to read what Booking.com users think, for example. 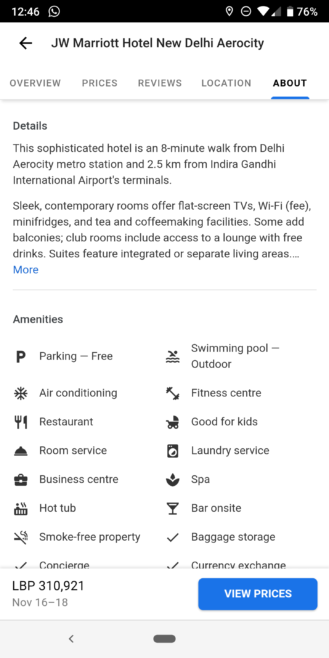 The new location tab includes insights about the hotel's surroundings and ease of access. The first tab provides highlights about the location with a score based on proximity of things to do, transit, and the airport. The second one gives you a list of nearby attractions, and the third one has quick access for directions/duration from the airport or other arrival points. In the previous layout, hotel amenities were seen from the overview tab and there was a button to expand them into a fullscreen view. 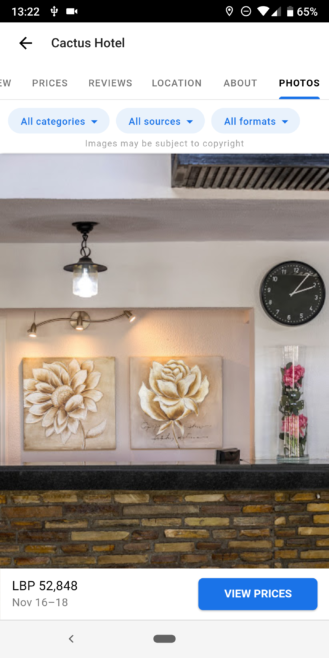 The new layout replaces that with a proper About tab, where a description of the hotel is provided, along with a list of amenities, plus various details about accessibility features, offerings and highlights, lodging options, payments, and the crowd frequenting the hotel. Left: Previous hotel amenities and details. Right: New About tab. The photos tab has seen another overhaul. Instead of the scrolling tabs for all photos, rooms and amenities, visitor and hotel submissions, 360-deg photospheres, and so on, there are three drop-downs to filter all photos. You can choose what you want to see (amenities, rooms, food and drinks, exterior), from which source (visitors or hotel), and whether you want photos only or 360-deg views as well. That looks neater and is more practical to browse. More surprising though is the lack of an option to expand an image to fullscreen. Both the uploader's name and the thumbs up/down buttons are at the bottom of a photo. While this is faster to browse, I am surprised by the lack of pinch-to-zoom to have a closer look at something. Overall, I would say I am more or less happy about the new layout for hotel listings. I will continue to do my own research, but price and location insights seem very handy for those who don't want to bother with that or those who need to select/eliminate some options quickly before delving into further research. 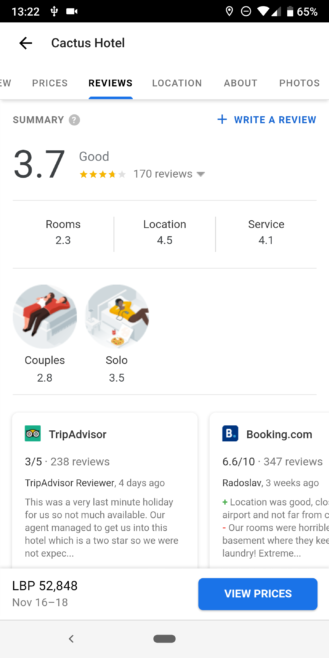 The addition of multiple review sources is even handier, as it gives a more complete look of the hotel's performance and helps us see if there's any discrepancy or flags being raised on some site but not on another. But I can't help but wonder whether the new layout is final or if it has been flipped on prematurely. There's no sharing function, no save to list, no overflow button (and all its sub-features), no Q&A section, no edit suggestions, and no pinch-to-zoom on photos. Those have been staple features of Maps and the fact that they'd be gone from hotel listings is worrying. The new layout appears to be rolling out server-side. I have it on my Pixel 2 XL and Nokia 7 Plus, but not on my Huawei MediaPad M5 8" tablet. Others have said that they don't have it either. I'm just hoping that it's a first draft, and the Maps team is taking the time to add back all the missing functionality.